Kubota Tractor Australia has introduced a new model to its successful range of BX60 series tractors, the 4WD BX1860 with 18 horsepower 3 cylinder diesel engine and 2 speed hydrostatic transmission. These new model BX1860 4WD sub-compact tractors are ideal for mowing, front end loader work, towing and all types of general purpose small tractor work. As with all Kubota tractors, operator comfort was at the top of the list when the BX60 series was designed, and the BX1860 versatile sub-compact tractor model is no exception. This tractor comes standard with a deluxe high back seat that provides the operator with soft cushioning and thigh support during driving operations. The operating platform features widely spaced fenders allowing the operator plenty of leg room and the ergonomically placed forward and reverse hydrostatic transmission pedals are split to ensure the operators feet are in the most comfortable position. An optional cruise control kit is also available to reduce the need to have foot pressure applied to the HST pedal while working in large open areas. Hydrostatic power steering is also a standard feature on all BX60 series tractors, making steering practically effortless and thus reducing stress and fatigue. The clear and easy to see white on black dash makes monitoring vital tractor functions easy, while the digital tachometer on the dash offers operators precise monitoring of engine revolutions, especially when operating the PTO. The design of the BX1860's slanted metal hood features bright halogen headlights for working from dawn to dusk. Metal has also been used in the fenders and operating platform for enhanced durability. 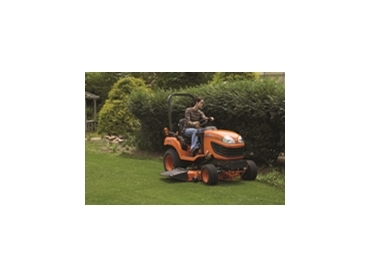 The BX1860 4WD sub-compact tractor, ideal for landscaping, can be fitted with a 5” deep 54 Kubota mower deck with an adjustable cutting height that can be controlled from the tractor seat. This height adjusting dial, mounted on the operating platform, has quarter inch cutting height adjustment increments between 1" and 4". The BX1860's mower deck is compatible with the Kubota LA203 front end loader. In addition, fitted as standard on the BX1860 is a single lever 4 position hydraulic valve. This valve has 4 hydraulic outlets mounted forward of the operator platform. This position ensures that any accidental oil spills during hook up of the loader does not fall onto the operator platform or onto the mower deck. Both front end loader and mower are quickly detached from the tractor should the tractor be required to operate without these items.